THIRTY years ago British migrant Fr Roger Burns never would have dreamed about retiring in Australia let alone as a Catholic priest. Born in Newcastle-upon-Tyne, in England’s north, Fr Burns had tried out a career as a shipyard engineer and then a teacher before being swept into a completely different vocation. “For seven years I ran away from the possibility of the priesthood,” he said. The idea had been “niggling” at the back of his mind and was often at the centre of conversations. “People would say to me, ‘Have you ever thought about the priesthood?’ and I’d say, ‘It’s not for me’,” Fr Burns said. No longer reluctant about a priestly calling, Fr Burns entered the seminary at Ushaw College, in County Durham, England, in 1980 while he was in his late thirties. “One of the priests from the seminary, the vice-president actually, said to me, ‘We better ordain you before you die on us’,” he said. 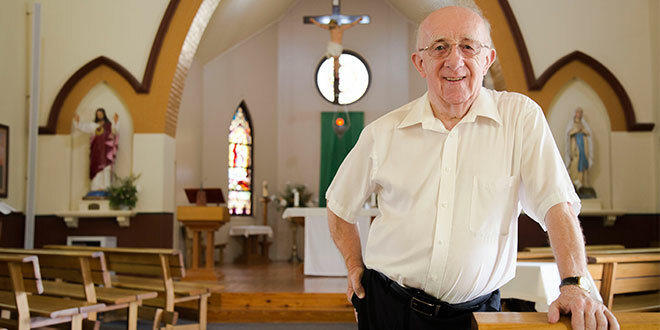 The retiring priest has now clocked up 33 years of service to the Church, including 15 years in Brisbane, where he has been living “by accident”. While visiting Brisbane for a baptism more than 15 years ago, his mother was involved in an accident where a dog ran into her, splitting her shin open. The doctor ordered her to stay in Brisbane for a month. Fr Burns was still a priest in the United Kingdom at the time, and asked his bishop if he could move to Australia to support his mother. He was granted a sabbatical year to investigate the possibility of moving to Australia. “My plan was to get her to live in Brisbane, and she had a great time,” Fr Burns said of his mother, who died several years ago at the age of 90. After relocating to Brisbane, Fr Burns took up a position as assistant priest at St Mary’s, Ipswich, before applying for the position as parish priest of St Francis Xavier, Goodna, where he has served for the past 13 years. His time at Goodna has now come to an end, and he leaves a string of memories behind. While his time in Goodna has been mostly positive, he wouldn’t mind having his second week rewritten. And nearly everything has happened, including a ceremony to mark Fr Burns’ Australian citizenship, which was held at St Francis Xavier in 2006. As Fr Burns settles into retirement, leaving the parish to former The Gap parish priest Fr Vu Dinh Tuong, he is reminded that good things come to those who wait. Five years ago canon law required priests to retire at 70, but a change of archbishop meant Fr Burns’ request was lost in transit. It was too late as the rules for retirement had just changed. Fr Burns was asked to delay his retirement from the priesthood until he turned 75, which will be in March. Despite the delay, the past five years have proved to Fr Burns that choosing the priesthood was the right decision. “I’ve tried engineering and teaching, but priesthood really is the best.